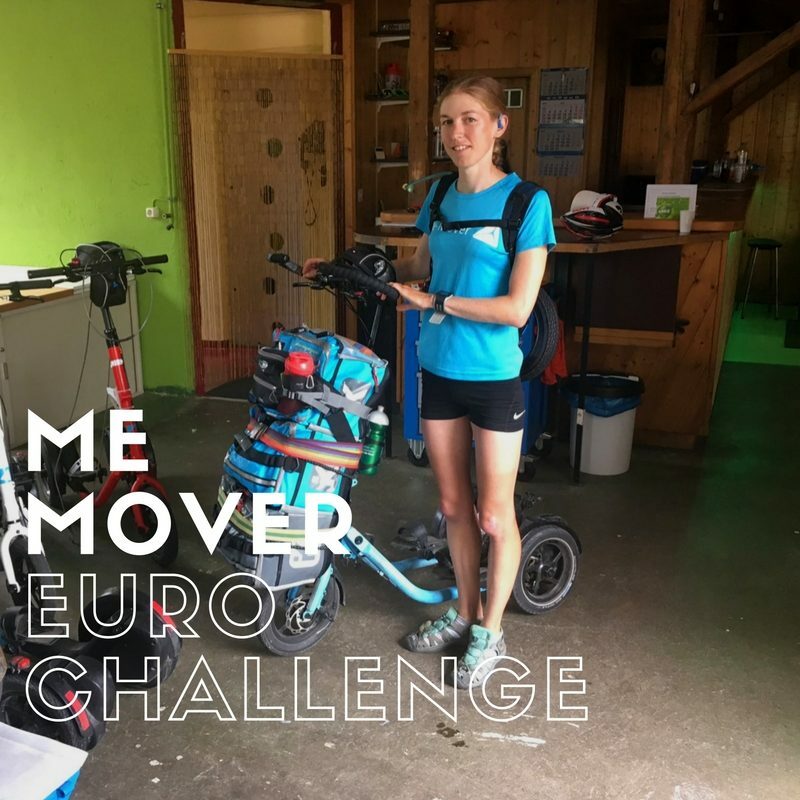 Natalie Thomas spent the whole of July undertaking the EuroChallenge, a feat of riding a Me Mover (stand up step bike with no motor or gears, www.me-mover.com ) 2170km from Copenhagen to Lausanne via Hamburg, Amsterdam, Brussels and Paris. Natalie, who plans to be a dietitian, has run triathlons before but wanted to inspire others to get moving and stay fit and active in a different and fun way. 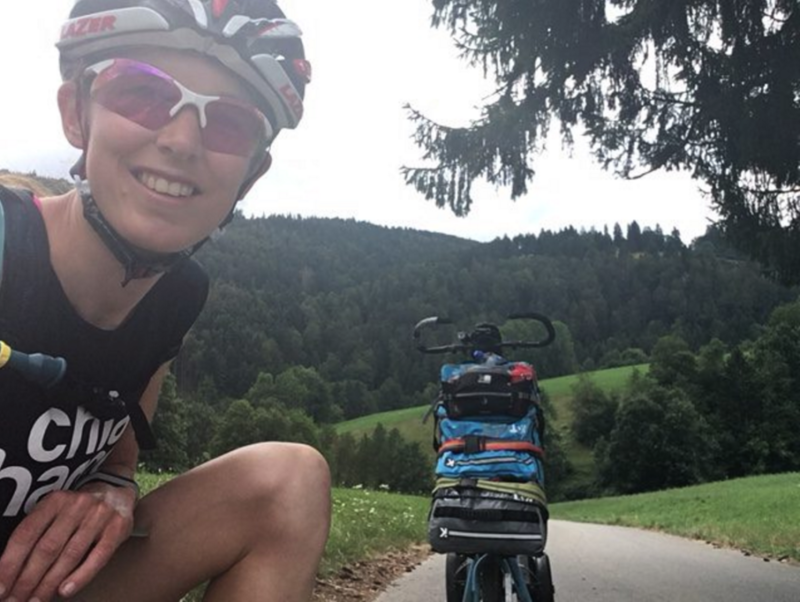 We got the chance to chat with her about her recent epic challenge. I am now back home safe and sound, maybe a little broken but a lot happier and really quite proud of what I achieved! I know it’s bad to brag but honestly when you have travelled this far alone with good times and bad it really does leave a big impact on your life and for me mentally has had the biggest impact of all, although I didn’t realise how much it had really taken out of me until I finished. It has been almost three weeks since my last day and I have been very lazy (activity wise), but have felt so much more tired than I expected although I am getting there slowly. To sum this up in one word that would be AMAZING, it had its ups and downs but it was one of the best experiences of my life. I loved seeing new places including visiting countries i hadn’t been to before, meeting lots of different people (even if communication wasn’t the easiest) and even though it was tough and I struggled toward the end i still loved it. How were your nutrition and energy levels during the trip? I did struggle at the start and end of the trip with this. I had prepared all my food beforehand with lots of breakfast, snacks, lunches, protein drinks and main meals but the sheer volume of what I was doing was burning so many calories that I was waking in the night hungry. This mean I had to supplement my supplies and mainly involved bread, milk and apples as thats what i really craved. One evening in the Netherlands after a pretty long and windy day i asked for bread, milk and a slice of caramel brownie cheesecake- that hit the spot. How much did you travel each day? My shortest day was 24.94km and 2hrs24 travelling (this was a unplanned move towards Rotterdam a day early) and my longest day was 148.61km with 9hrs59 of travelling time. I also want to mention my ascent as my climbing total during the whole trip was higher than Everest at 13,397m which the biggest day 1714m in Switzerland. How did you find being completely alone? Surprisingly it didn’t phase me at all, in fact i think on a personal level it did me some good to gain in confidence and just learn to deal with any situation and get on with it. It also gave me a lot of time to think about life in general and how I had been feeling before the trip. I am not going to lie, the day after I finished I felt absolutely terrible! The only thing that made me feel better was the huge buffet at the Olympic museum. I just felt completely wiped out and it was like my body knew it was all over and was just telling me to rest. It took me a good week to start feeling a bit like normal in the mornings and only now can I go a whole day feeling good. I guess I forget that this was an epic challenge and I did put my body through a great deal. Tiredness aside mentally I was elated and proud of what I achieved, as I said before sometimes I forget how big this trip really was and I cant quite believe I made it so far on the Me Mover using my own energy power. I was relieved to finish but upon retuning home I found it hard not being so active, however I also couldn’t be bothered to do anything. What do you think of the Me Mover? I only picked up a Me Mover to train on 4-6weeks beforehand so didn’t have that long to train but it was enough to see me through as I was pretty fit from Triathlon training anyway. It takes a couple of trips to get used to the movement and balance but once you’ve got the hang of it, it’s great fun and an amazing form of cross training. I did not have any overuse or strain injuries at all during the trip and it improved my leg strength significantly. I also found that it has improved my balance hugely and can now stand still on one leg with my eyes shut. I didn’t have any mechanical issues at all (other than the broken foot loop caused by the crash), not even a puncture! I did check my tyres regularly for stones and pumped them up every couple of days along with lubricating the chains. Overall this is a fantastic fitness device for all abilities and would be great for athletes wanting to cross train or keep fitness during injury. Its a really fun way for people to get out there and get active and has much less impact than running. 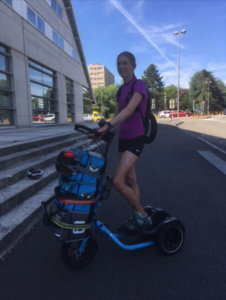 Top Swiss Triathlete Nicola Spirig has also given one a go and liked it, my mum is also hooked. Yes it has, it made me realise that I shouldn’t try and be what I think others want me to be. I should be myself, wear what I want, sing in public, give my opinions and just generally be myself, if other people don’t like who I am then I guess it doesn’t bother me any more. I have also gained so much confidence and have been doing radio interviews and not even felt nervous which is crazy considering a few years ago I wouldn’t even phone people myself. Pushing outside your comfort zone is something I highly recommend as it really does develop you as a person and makes life so much more fun. I did this trip for both personal and public reasons. Firstly I was struggling with how I felt about Triathlon training and racing on an elite level, having struggled with anaemia and over training syndrome. This opportunity came at the perfect time to get me away doing something different and active but also give me the time to think about where I really wanted to go with sport. The other reasons I was doing this is to raise funds for the Danish Diabetes association and Diabetes UK, a great charity as I have both type 1 and 2 diabetics in my family and the trip was all about being fit and active which are great for helping diabetics and also can prevent people getting type 2. I managed to raise £759 for Diabetes UK and around $875 for Danish Diabetes and if you would like you can still donate via the links (click on the charity names to get to these). Finally I wanted to inspire others to get out there, get active and challenge themselves. Not necessarily on such an extreme level, but on a suitable level for personal ability and fitness, even a short walk is getting out there and doing something. Do you have any other crazy plans for the future? Maybe a little crazy (thats me) but I want to go from John O Groats to Lands End on the MeMover as fast as I can! Although in the near future I am going back to college to do an access course so I can go to University and become a Dietitian.